Linoleum flooring is durable enough to last a long time, which helps explain why it so often looks badly out of style. If you're ready to update that old linoleum floor, one quick and easy way to do it is to install a peel & stick vinyl tile floor right over it. 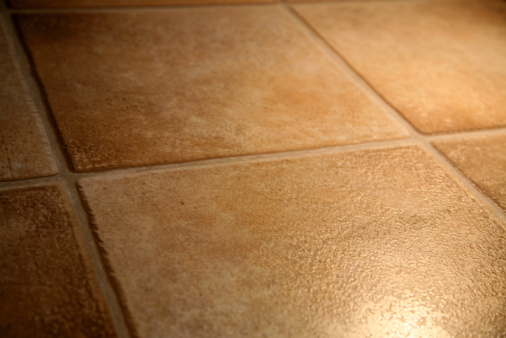 As long as the linoleum is solid and flat, with no areas coming up, you don't have to remove it. This can work for either linoleum tiles or single-sheet linoleum. Run your belt sander over the linoleum surface, from one end of the room to the other, to dull the surface. Vacuum up the dust. Divide the surface into four quadrants, finding and marking the middle of each edge of the floor with your tape measure and pencil, and then using a chalk snapline to lay two perpendicular lines dividing the floor in half in both directions. Use a square at the point where to the lines intersect, at the middle of the floor, to make sure they're 90 degrees off each other. Pull the paper backing off the first tile. Set the tile firmly to the surface, at the center of the floor where the two lines intersect, so it's bordered on two adjacent sides by the lines. Peel off the paper from your next tile. Press it to the floor nest the first one, butting the edges against each other first and then pressing down the rest of the tile. Repeat, setting each new tile off the previous ones, building out from the middle of the floor toward the edges, using the lines to keep the grid straight. Lay all the full tiles that will fit, leaving space around the perimeter of the floor where there will be partial tiles. Measure the remaining space between the last full tile in each row and the wall. Transfer the measurement to the tiles. Cut them with a utility knife, by scoring a line on each tile at the mark, then snapping them in two at the line. Set the cut tiles with the cut sides facing the wall.